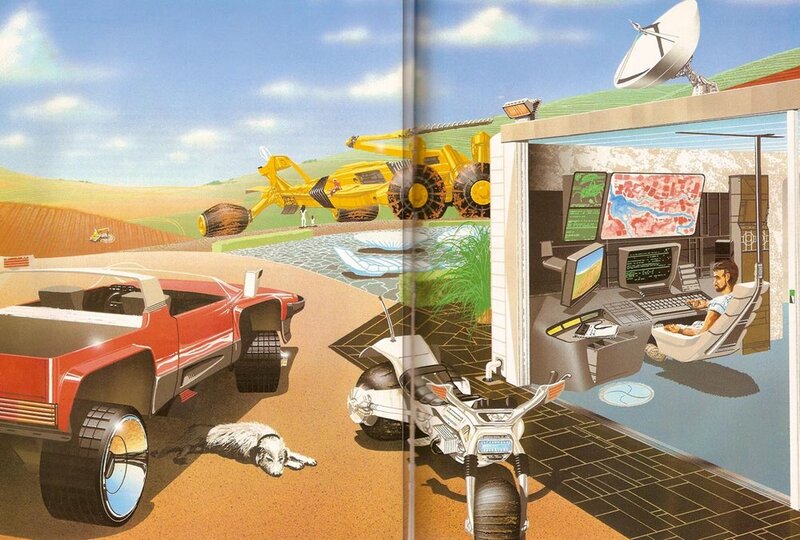 The illustration above is featured in the book The Future World of Agriculture (Walt Disney World EPCOT Center book), published in 1984. The farmer in this artist's conception of a farm of the future sits in his computer room (right), studying images of his fields beamed down from a small Landsat satellite. The red spots on the screen indicate crop stress that needs to be corrected. With the aid of his computer, which processes the data and suggests a solution, the farmers solves the problem. Robots in the field (one is seen at far left) take the corrective action ordered by the farmer. At center, the farmer's wife and child talk to the operator of a huge farm machine used for plowing and planting. Read more about farms of the future here.